Over the last several days, the New York ASPCA’s killing of a dog named Oreo has ignited a furor among animal lovers nationwide. ASPCA tried to justify it by claiming she was aggressive. But the question of whether or not Oreo was beyond rehabilitation is merely a side story to the most significant issues raised by Oreo's execution. And while Oreo’s killing by those who were supposed to be her protectors has left too many questions unanswered, what has emerged as the most significant one is why did Ed Sayres, the President of the ASPCA, rush to kill an abused dog when the public demanded that she be saved and a sanctuary had offered her lifetime care? 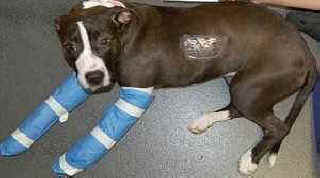 Last June, a one-year old dog named Oreo was intentionally thrown off a sixth floor Brooklyn roof top by her abuser. 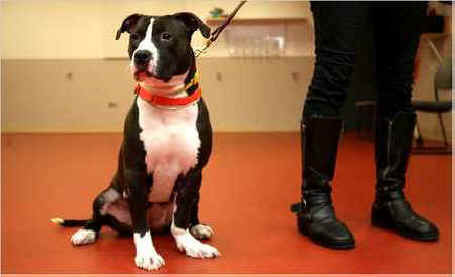 Oreo sustained two broken legs and a fractured rib. Although the facts are sketchy, Oreo also appears to have been beaten in the past—several of the neighbors in the building where Oreo lived reported hearing the sounds of the dog being hit. The miracle was short-lived. According to Ed Sayres, the President of the ASPCA, when Oreo recovered from her injuries, she started to show aggression. After a series of temperament tests, Ed Sayres says he made the decision to kill her. The New York Times reported the story the day before Oreo’s scheduled execution. Despite the best efforts of Sayres to spin the outcome, the furor and condemnation by dog lovers all over the country was immediate. In an attempt to contain the wrath of the animal-loving community against him, Sayres issued a press release replete with crocodile tears (“We are all upset by this”), saying that she was truly vicious, and arguing that lifetime care in a sanctuary would have meant no quality of life. Sometimes, Sayres said, there are no happy endings. Early on Friday morning, Oreo laid dead, the victim not of her former abuser, but of an overdose of poison from a bottle marked “Fatal-Plus,” at the hands of a shelter bureaucrat. Facts are troubling things. Facts get in the way of a contrived story. And there is one troubling fact that all of Ed Sayres’ double-speak simply cannot overcome. Try as the ASPCA might to argue that Oreo’s death was unavoidable, Sayres’ misrepresentation has one fundamental obstacle: Oreo had a place to go. The issue doesn’t turn on the real extent of Oreo’s aggression. The real issue is that a No Kill shelter and sanctuary, with experience rehabilitating aggression in dogs, which works with area shelters that could have vouched for their credibility, which enjoys wide community esteem, and which is only a short drive outside of New York City, offered to give her lifetime sanctuary, and was refused. They called and left a voice mail message on Sayres’ telephone. They called his secretary. They called the ASPCA Press Office. They contacted everyone on the ASPCA website contact page. And they were ignored, hung up on and lied to. Pets Alive in Middletown, New York, is not only a member of the Mayor's Alliance for New York City animals, of which the ASPCA is also a member, they are not only an Alliance-approved rescue partner, they not only have had experience with aggressive dogs, but they agreed to take responsibility for a dog the ASPCA was committed to putting in a body bag and then dumping in a landfill. Even though Pets Alive is already an approved rescue partner, the fact that Oreo may have presented a special case didn’t mean the offer should have been rejected out of hand. The ASPCA could have visited Pets Alive; they could have checked veterinary references, community references, could have insisted on specific precautions and liability waivers. But instead, early that morning, before the "media circus got out of hand," Ed Sayres, willfully, neglectfully, cruelly, and dishonestly, chose to kill Oreo instead. That is the true face of the ASPCA. And that is intolerable. Ironically, had these events taken place in California, it would have been illegal for the ASPCA to kill Oreo instead of giving her to Pets Alive. In 1998, the California legislature overwhelming and bipartisanly passed a law making it illegal for a shelter to kill a dog if a No Kill shelter or rescue group is willing to save that dog—even in cases where the shelter says the dog is aggressive. Having worked in San Francisco, Sayres should be sensitive to the fact that the ASPCA, which claims a leadership position in this movement, should not have a more regressive policy than one approved by an overwhelming number of politicians on both sides of the political spectrum and the State’s Republican governor. And yet the ASPCA, under Sayres, proves once again that the large national organizations have no vision, no desire to truly raise the status of animals in society, and despite claiming they are setting the bar on how society should relate to animals, that they are in reality staffed by those who would rather perpetuate the violence and betrayal Oreo already experienced by killing her—even as true animals lovers offered them a simple, life-affirming alternative, and the second chance at life Oreo so richly deserved. And as an agency which claims to be the leading voice of animals, the ASPCA has a duty to continually push the envelope and raise the bar on these issues: to ask the tough questions, to give the issue the time it needs to arrive at a just and thoughtful resolution. Instead, the ASPCA rushed to kill Oreo and permanently closed the door to an animal that needed the full force of the ASPCA’s compassion—and vast resources—the most. A few short years ago, this case would have had the same tragic ending, with the majority of the dog loving public angry that Oreo’s life had come to this short end. But their anger would have been directed only at her former abuser. Today, that anger is still strong, but it is also being directed at the agency which was supposed to protect her from that ultimate harm and fundamentally failed. This is the same anger that forced Humane Society of the United States CEO Wayne Pacelle—like Sayres, another stalwart defender of killing—to stop pursuing the automatic destruction of abuse victims. Today, despite the claims of aggression which would have ended the dialog in the past, people want, deserve, and believe the dogs deserve the happy endings to which they are not only entitled, but which are readily available if men like Sayres and Pacelle would only give it to them. But time and time again, they choose not to. That Oreo may not have been an immediate adoption candidate due to aggression issues is therefore secondary to the will of the people who wanted Oreo saved, who demanded that Oreo be saved, who were not swayed by false calculations of quality of life, of talk of being traumatized, of any other rationale that would have allowed Sayres and Pacelle to kill dogs without public condemnation. People are tired of the excuses, they are tired of the justifications, and they are tired of the killing. Missing completely from the ASPCA’s response is any acknowledgment whatsoever of the concerns and outrage of the public who fund their work. The public was disrespected; their concerns guided by compassion disregarded. The gulf between what the public expects from a humane society and the conduct of the ASPCA and others in their league is so at odds with humanity, a gulf so wide, it cannot be crossed. Instead of building a bridge to create needed dialog, Ed Sayres mounted a barricade from which he ran a self-serving propaganda campaign to force his views. He forgot that the ASPCA is publicly funded. He behaved like a dictator, not a leader. No analysis on Oreo’s death would be complete without an evaluation of how the ASPCA determined that she was aggressive: Did the ASPCA evaluate her fairly? Given the abuse she suffered, how painful was she? Did they give her enough time to learn to trust again? Critics have charged that the ASPCA set her up for failure. That is an important issue and one that cannot be left to the often self-serving claims that have defined the ASPCA over the years. As in many of these cases, people are questioning whether she was truly as aggressive as Sayres is trying to make out. There have been unconfirmed reports that staff and volunteers have claimed the ASPCA is exaggerating, and the ASPCA has not yet released any videotapes of her which would shed light on the real extent of her alleged aggression. According to unconfirmed reports, two staff members indicated that while the dog did show aggression, she could also be very affectionate, and as a result, they felt she was treatable. Unconfirmed reports also indicate that staff members asked Sayres for a reprieve so she could be placed in a sanctuary. And finally, unconfirmed reports indicate that a volunteer was able to go in and handle Oreo, despite some aggression issues. I have not been able to verify the veracity of these claims, but since this is secondary to the main issues above, their resolution would not alter what should have been the outcome. Sayres inherited an SPCA with a strong infrastructure, departments that had become the envy of the growing No Kill movement, and a fundraising apparatus that had amassed an endowment of over forty million dollars. [He] would not fully leverage the opportunity he was given. In a short period of time, with money being wasted, fundraising opportunities missed, deficits created, an increasingly bloated bureaucracy developing, and key programs gutted or eliminated, the SPCA finally abandoned all pretensions toward No Kill in San Francisco. This is a man who, as head of the wealthiest and most powerful SPCA's in the nation, claimed on the front page of USA Today, the most widely circulated newspaper in the country, that not killing was the moral equivalent of killing. This is a man who in Austin, Texas, has chosen to attack No Kill and shelter reform advocates and hinder their goals by throwing his organization’s support behind a shelter director who refuses to embrace alternatives to killing and who also kills tens of thousands of animals annually despite hundreds of empty cages at her facility. Sayres is also taking credit for the modest decline in killing this year which is exclusively the result of the work of a private rescue group saving the animals the ASPCA-partner shelter is otherwise determined to kill. During my tenure with him in San Francisco, Sayres rarely ventured out of his office, almost never walked the kennels or interacted with the animals, and was so detached, that he simply signed off on whatever his staff said, no matter how regressive those he hired were (and there are plenty of regressive people at the ASPCA also). But there is one incident in particular which sheds light on the Oreo case. When I was working with Sayres in San Francisco, he had signed off on the killing of a dog who I felt deserved further evaluation. He made the decision to kill a dog without seeing the dog, without observing the evaluation, without, I would venture, even being able to pick the dog out of a kennel of other dogs. I objected and suggested that we needed to set the bar higher. I gave him a formal proposal that, before killing an animal, he appoint a guardian ad litem, someone who would represent the dog (or cat) the same way an attorney would defend the accused during a death penalty case. It would not cost him anything, as I was an attorney, I already worked there, and I agreed to represent the animals whenever a behaviorist or veterinarian issued the death warrant. He said, “No.” Ironically, that is the process used in the criminal and civil case against dog slayer Michael Vick. A guardian was appointed by the federal judge overseeing the disposition of the dogs. As a result, the vast majority of Vick’s victims were saved. In other words, when Sayres is given the chance to be fully involved, he chooses not to be, even when it means death for dogs at the shelter he oversees; or when it means a lost opportunity to advance this movement, as would befit someone in his position. In 1866, over 140 years ago, Henry Bergh began the modern humane movement in the United States with the founding of the ASPCA. For the rest of his life, Bergh devoted himself to saving the lives of animals in and around New York City. For over two decades, Bergh spent each and every night, regardless of freezing temperatures, walking the streets of New York City tending to sick animals, fighting for their rights, working to save them, and confronting—and stopping—their abusers. At the time, New York City had the largest horse-pulled railway in the world. In one poignant incident, one evening in February of 1871 during the evening rush hour, working people rushed for the cars, and the horses began to strain with heavy loads through snow and slush. As one overloaded car reached the corner near where Bergh stood, the driver was ready to give the horses another lash when the call came to “Stop!” and “Unload!” It was Bergh. “Who the hell are you?” came the reply from the driver. “Unload!” called the order again. When the driver refused, Bergh reportedly pitched him into a snow bank and unhitched the horses. Often, Bergh would completely stop traffic on the lines, causing traffic jams that would leave thousands of people stranded and cursing to no avail—because one man had stopped all the traffic to protect a single horse. As hard as Bergh labored to protect all animals, he worked equally hard to protect dogs, particularly against abuses at the hands of city dogcatchers. Through prosecutions of abusive dogcatchers, lobbying for stronger laws and greater protections, and by striving himself to save them, he reduced deaths for dogs at the hands of the city pound by over 80 percent in just one year alone. Henry Bergh would not have killed Oreo. Today, Ed Sayres sits in the chair once occupied by Bergh. He does not advance the cause of animal protection. He is not a tireless champion on their behalf. He does not faithfully represent Bergh’s vision, nor does he faithfully represent how most Americans now feel about animals. Instead, when given the opportunity to save the life of an animal, he cowers in his office, refusing to return telephone calls, while collecting a paycheck of half a million dollars a year. On the afternoon of Friday, November 13, Ed Sayres had a personal driver take him home. Oreo’s body was sitting in a freezer, waiting to be delivered to a landfill. Toward the end of his life, Bergh would often lament, “I hate to think what will become of this [SPCA] when I am gone.” Ed Sayres has answered that question for him. And Sayres’ answer: “an agency that kills savable dogs,” would have hurt Henry very deeply. When I was growing up, the ASPCA represented very little beyond an annual fundraising calendar with pictures of kittens and puppies and platitudes about the human-animal bond. And while we have all grown up to demand more than calendars and killing, the ASPCA has not. And while that agency claims to be a leading voice for the animals and the people who love them, their actions toward Oreo demonstrate otherwise: The ASPCA doesn’t represent the dog lovers at Pets Alive. It doesn't represent the values of the American people. It no longer represents the fierce compassion of its founder. And it certainly doesn’t represent dogs like Oreo.